MORE THAN ONE INCOME STREAM DOESN’T MEAN YOU’LL BE RICH! When people tell me that they earn a second income I’m impressed and nosey at the same time. Who wouldn’t be? I’m always keen to understand why people choose to earn extra money whether it be to get ahead or to stay afloat. 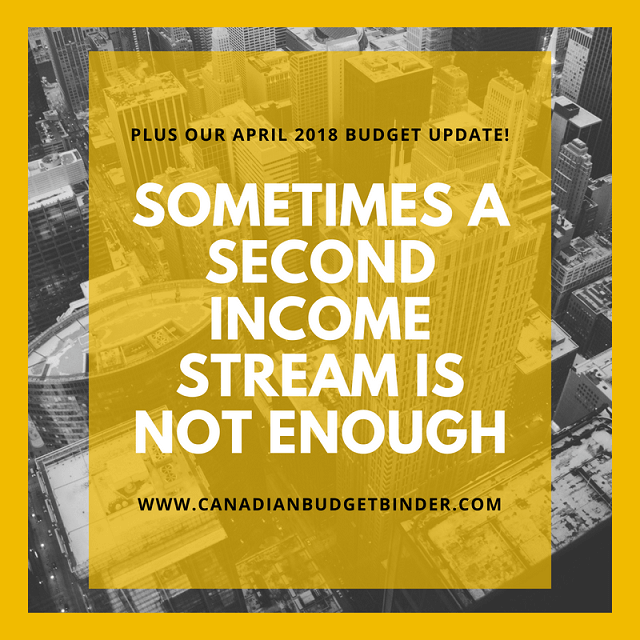 A few months back I had a gentleman send me an email to ask about a third income stream because the money he earned wasn’t enough to make ends meet. As you know I worked two full-time jobs for many years just to get my foot in the door to where I am now a permanent employee but it’s not something that was easy. Sometimes I dread thinking back to all the time it took away from my family but it was something I did for all of us. A second income however doesn’t mean a second full-time or even part-time job it simply means earning extra money aside from your main money source. There are many of you reading this right now who probably have multiple money streams and YES that is awesome but as we all know the best money earned is that where you earn it in your sleep. We call this passive income. Automatically I’m thinking something isn’t working out for his finances so I decided to dig a bit deeper into our conversation. This is where he opened up to me about how he has a habit of spending money on his kids when it’s his turn to take them for the week. He is divorced and in an amicable relationship with his ex-wife in regards to the kids and he will do anything to make sure they are happy and have everything they need. Deep down though he has this guilt that eats away at him because the relationship failed and he fills that void or darkness with happiness which in turn costs him money. Not only that but it’s eating up time that he can’t get back in his life because he’s so busy working to earn that second income that’s not getting him ahead. When I asked him about budgeting he told me that he did not use a budget (cringe, I know) but he did pay his bills on time. Fair enough, not everyone wants or needs a budget but in his case I thought perhaps a month of two of investigation might help brighten the money picture. 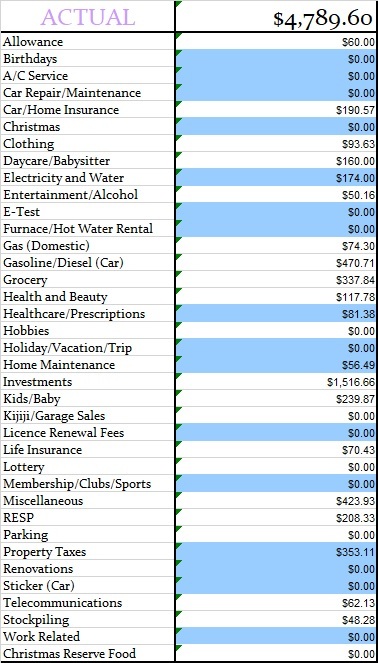 We used a basic budget sheet to find out where his money was going since he doesn’t really have any debt besides his mortgage. The hardest part for him was to keep his receipts but as daunting as this seems it is a MUST to understand financial habits. His credit cards are paid in full each month but what he doesn’t have is any savings. He’s worried about retirement money since he has minimal RRSP’s $53,000 and he’s in his early 40’s. Although he earns $80,000/yr at his day job as a Business Systems Analyst and approximately $140 fixing computers on the side he’s still breaking even most months. There are times there is money left in the bank but that’s depleted by emergencies that come up which most people aren’t prepared for. Just last month he had to replace the guttering on his house which cost him $1000. Although he had the money because he earned it that month he wasn’t able to do what he normally does with his kids. What in the world is he buying his kids? Why would he need a third income? Although having an income stream is a great way to build wealth especially passive income but this isn’t one of those scenarios. Let’s examine the three questions above so we can understand his financial situation a bit better. After his basic budget examination we learned that a large majority of his money was going to eating out, entertainment and spending too much on groceries. He spares no money when it comes to his kids especially paying for sports and other activities which in part he splits with his ex but he is the higher earner so he often pays the most. He needs a third income to increase his savings potential especially his retirement income which worries him and why he emailed me. Keep in mind this is a basic budget and this number will fluctuate for him as he doesn’t typically budget his money. He just spends which is why people end up living pay to pay especially when they think they earn more than enough money, but they don’t. It sure does add up fast. There were a couple of recommendations that I passed along especially regarding his idea of a third income. Firstly, a second income is great but it’s not passive but it is something. He has to take time from his day to earn that second income even though it’s small. Can he increase this income stream and how? A third income source would be a further burden on time unless it is something he plans as passive and lots of folks out there are making tonnes of money this way. Perhaps saving money to buy a rental property, blogging, investing, writing an e-book about technology fixes, Set up a You Tube channel or even renting a room or space in his house would be ideal. Moving is not an option as his job as he shares the kids who are 8 and 11 years old. He also has a secure job which he enjoys going to and a house that accommodates his family nicely. His truck is used and although the gas seems high it’s typical of a working family vehicle these days with the cost of petrol. Selling it for something smaller is an option but is it worth it for him, probably not at this point. Like most families who are struggling financially a quick look at groceries and eating out always paints a wide-eyed picture because that’s where a huge chunk of money is going. Most certainly we discussed a grocery budget in particular a cash budget so he knew how much he had left to spend. Ideally, lowering the costs of eating out will help assigning a grocery budget will also save money. For a family of three a reasonable budget for his area of $500 is more than enough monthly. Although he feels guilty about his relationship break-down buying his kids ‘stuff’ isn’t going to make it any better. Spending time with them at the park throwing a Frisbee, going for a picnic or even swimming at the beach in the summer costs less than expensive getaways and trips to the mall. There has to be a balance financially when it comes to family time in accordance with what you can and cannot afford. One of the most powerful skills you can teach your children is money management but unless you have it under control yourself it’s hard to teach someone else. I believe that once he works out some fun things to do with the kids input about spending their time together they will find progress in their relationship. Buying stuff does not bond people, rather doing things together builds relationships and a love for all things family. Most importantly he needs to start an emergency savings fund and ramp up his retirement savings. To do this a third income isn’t necessary. If he can increase his second income and get his first income under control using a budget then he should have more than enough money to save. The good thing about his second income is that he has an established client base which means word of mouth advertising or using other platforms such as Kijiji or Facebook might help drive more business his way. A second income is always a great way to increase income but not if it is needed to fund stuff that should have financial limits. If you want to get ahead with your money you need to get in front of your finances before it beats you to the finish line. Often that is a line crossing no one wants to cross. The point of this small budget exercise although short was to point out areas where he could make improvements and to understand where the money was going. Sometimes the best wake-up call is simply talking to someone about your money situation. Discussion: If you were to earn a second income what would you do with the money? What other tips would you offer this reader? During the month of April, we started to sell off Jr CBB’s stuff that we had acquired over time because it was consuming all the space in the basement. We’ve made back $1800 so far. The rest of the month went without any major changes. Most of the month was dedicated to sorting. So we’re making headway in the cleaning department and the financial department at the same time. Our savings of 40.19% includes investments as well as any savings for this month based on the income of $8761.55. We put money away for the projected expenses for things that need to be paid for in the coming months. 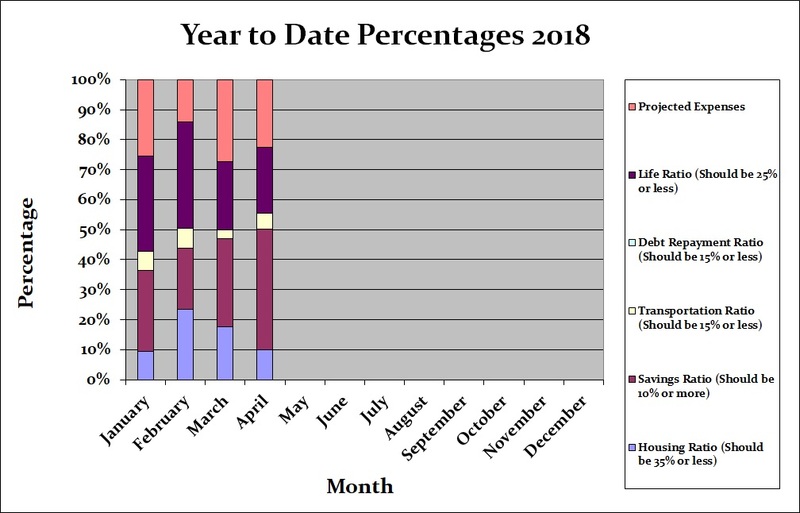 The other categories were fairly normal this month, even if the Life Ratio is a little high and close to the maximum. 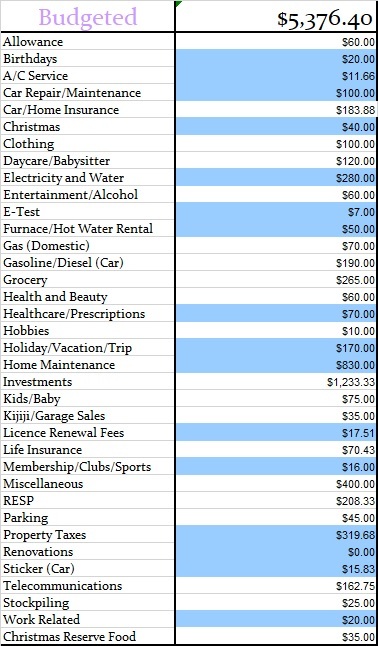 All of the categories took 100% of our income which shows that all the money we earned for the month is accounted for. Time for the juicy category numbers and to see how we made out with our monthly budget. Below you will see two tables, one is our monthly budget and the other is our actual budget for the month of April 2018. 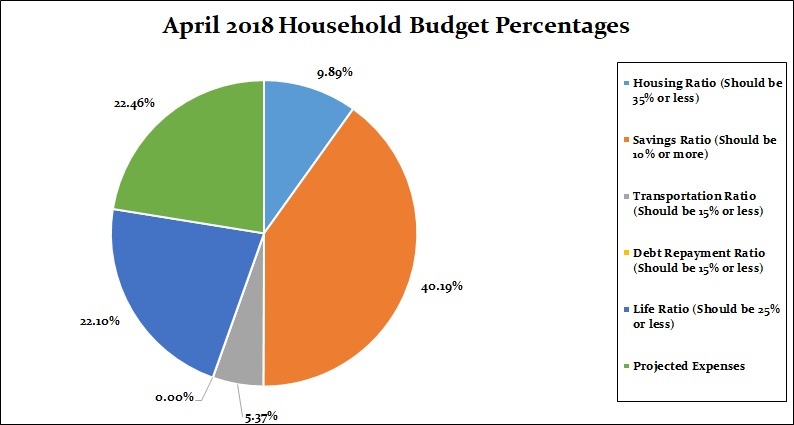 That’s all for this month check back at the beginning of June 2018 (sometimes in the middle) to see how we made out with our May budget. As usual – another beautiful and informative post – my wife and I quit our jobs in 2005 after learning how to make the Internet our only source of income – however, that means when the search engines change they’re algorithm we go scrambling and then we’re tight for a couple of years as we build new web properties, but over time we still make much more than what the airlines are paying my wife and I.
He’ll also tell you that the vast majority of his pay cheque disappears, lickety split, to our high interest savings accounts to fund our mid-term wants, needs and desires. He hates having only $40 of his pay cheque for his “allowance” but he does enjoy that he has never, in nearly 25 years of marriage, had to do without anything he NEEDED as a result. WANTS on the other hand are always achievable but we save up for them. Tracking your spending and having a budget made a huge difference for me. After my first month tracking my spending I realized I was spending $500+ per year on coffee and it wasn’t something I even enjoyed that much it was mostly out of convenience. Once I saw exactly where my money was going it became much easier to prioritize.